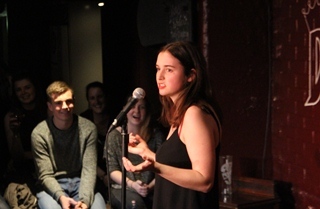 Most students will be familiar with essay writing in an exam hall, but not many are assessed telling jokes to a packed crowd in a popular London comedy venue. Yet that's exactly what happened in May, when 19 BA Theatre Arts students took the plunge and did a ten-minute stand-up set as the final act of their course. 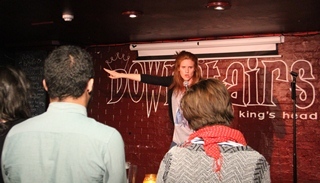 The popular Downstairs at The King's Head comedy venue in north London's Crouch End has been hosting the Middlesex end of year comedy show for over 25 years now, with Australian comedian Sarah Kendall (right) returning this year for a second time as compere. "It's something that I'd never pictured doing before," explains Matt Jopson. "If I hadn't studied this course I'd never have thought of doing stand-up. It's terrifying, but this gives you the chance to give it a go." Taught by Theatre Arts (Solo Performance) Programme Leader Sam Beale and comedian Steve Best, the course gives students a thorough conceptual understanding of stand-up comedy. 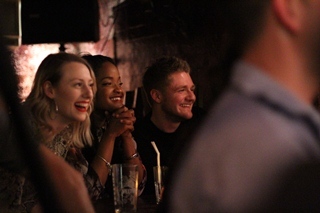 The module encourages them to watch and write about the work of a range of stand-up comics, and teaches them how to think, write and perform as a comedian. Workshops and seminars are then used to help students develop their writing and performance further, refining their work until they're ready to perform in front of a live audience. "The tutors are all professionals so they've been in the situation that we were going in to," says Tom Darby. "It was nice to learn from people who understood our situation. That made it a lot easier." Charlie Gardner agrees. "The support we received was incredible, because Sam and Steve knew what we were going through," she says. Some of the Theatre Arts students are now planning on writing more material and trying to establish themselves on the stand-up circuit, but all agree that from start to finish the experience was great fun. "It's like getting on a rollercoaster," says Charlie "You don't want to get on at first and then you're scared throughout, but as soon as you get off you just want to get back on again. "It was freaking fantastic, and we've all become really good friends as a result of it." "Doing it in your final year really pushes you on," adds Ava Pickett (right). "You have to choose your modules knowing they're the last modules you're going to study at Middlesex, so it's a chance to go out with a bang."